Kalisto is the new U.S. Champion after upsetting Alberto Del Rio. Brock Lesnar, despite protests from Paul Heyman, will be in the Royal Rumble. Basically, Heyman lost a negotiation with the McMahons to have Brock main event WrestleMania and skip winning the Rumble. Various members of the roster where on the stage when Vince and Stephanie McMahon came out, so I was wrong about Vince and Stephanie wanting to avoid the CFP title game. The New Day danced to Vince's music. Vince said one of the 29 men on stage were going to be the next WWE World Heavyweight Champion. You had people like Fandango, Damien Sandow (back in his old wardrobe), R-Truth and Stardust out there. Vince singled out Dolph Ziggler for possibly reaching out for the brass ring. You'd think he'd drop that phrase at some point. Stephanie mentioned Kevin Owens possibly concluding the best first year in company history. Then the Wyatt Family appeared, with Bray Wyatt appearing at the announcer's desk and repeating his "Anyone but you" Roman catchphrase. Roman Reigns came down. Reigns asked Vince "What happens if I win?" Stephanie laughed and called him delusional. Vince said he wanted to give Roman a chance in a match called a "1 vs. All" match, where Reigns would face as many as 2/3rds of the roster tonight. Stephanie mentioned Reigns could face his brother Dean Ambrose, but Vince corrected her and said Ambrose already was booked in a match. At that point, Sheamus hit Ambrose from behind, and Vince announced Sheamus as Ambrose's opponent in a match that started immediately. Sheamus took the match to the outside, where he threw Ambrose into the barricade several times. Ambrose turned things around and sent Sheamus into the post twice, the last of which led to Sheamus bleeding heavily. Apparently, Brock Lesnar gave Sheamus lessons on how to run into the post entirely too hard before the show. Ambrose cleared the announcer's table like he was going to put Sheamus through it when Owens ran out and jumped him. Owens left Ambrose laying again with punches and tried to power bomb him through the table before he was pulled off by the referees. Match was strung together well but the crowd lost interest by the end. Rene Young went to the trainer's room to check on Ambrose, who stormed out saying he still had a pulse and that should concern Owens. Vince and Stephanie compared dance moves in the back when they stumbled upon Paul Heyman, who put over Vince's 1 vs. 100 concept. Heyman didn't want Lesnar in the 1 vs. 100 match and wanted to fight in the main event of WrestleMania. Vince asked Heyman not to change his plans again. Heyman tried to talk Vince into having Brock face the winner of the Royal Rumble. Vince didn't like the idea. Stephanie tried to keep the peace by having the two meet in private. They all gathered in a small conference room with Vince looking pissed. This is probably a scene that unfolded countless times in the runup to the last December to Dismember. Chris Jericho will host a Highlight Reel with the New Day later tonight. Drew Brees was in the audience. He got no reaction at all, which was shocking unless you consider he may have played his final game as a Saint. JBL used the match to throw in as many David Bowie references as possible, including "Ziggy Stardust" and "The Man who Fell from Earth." Titus O'Neal won with Clash of the Titus. I could have sworn I saw this same match last week. O'Neal celebrated with the fans until Stardust, who had his face painted like Ziggy Stardust and the Spider from Mars album cover, jumped him. Jericho came out showed off various tweets trumpeting his return and his return to the Royal Rumble. He wore a blazer with a tie and black scarf. New Day came out, with Jericho getting a nod to Lemmy saying "Overkill" and trying to get the crowd to chant "Rooty Totty Botty." Big E. talked until the Usos showed up with their Slammys. The Usos wanted a match. Xavier Woods said the only tag team worse than the Usos were Ricky Gervais and Mel Gibson. Jericho arranged a match with Big E. and Kofi Kingston with Woods in their corner against the Usos with Jericho in their corner. Good match with Jey Uso getting the hot tag. Jey went for the splash on Kingston, but Woods distracted the referee and Kingston crotched Jey. This led to Jericho taking Woods' trombone and blowing it full throttle in Woods' face. Woods took a bump. Jericho then destroyed the trombone, which brought a reaction from Woods that was absolutely priceless. He acted like his pet puppy had been thrown down a well. In the midst of all this, Jey pinned Kingston with a schoolboy cradle. In the opening minutes, Woods did some ringside banter that sounded like a takeoff of HHH's late-90s interviews. Looks like Usos vs. New Day for the tag team belts at Royal Rumble. Michael Cole acknowledged John Cena's shoulder injury and that he would miss WrestleMania. Heyman and Stephanie emerged from their meeting with Vince. Stephanie said Paul was driving her father nuts. Stephanie wanted Brock in the Royal Rumble. Paul told Stephanie to tell her father that Brock Lesnar says no. Stephanie, since she has to get the last word in with any segment involving Heyman but all characters that you see on Raw are purely fictional and in no way resembles real life, told Paul that Broke would in the Royal Rumble because her father owns Brock's contract. Paul said that would be stupid because it would telegraph the finish of the Royal Rumble two weeks early. Well, no, he said he would handle this for Stephanie. 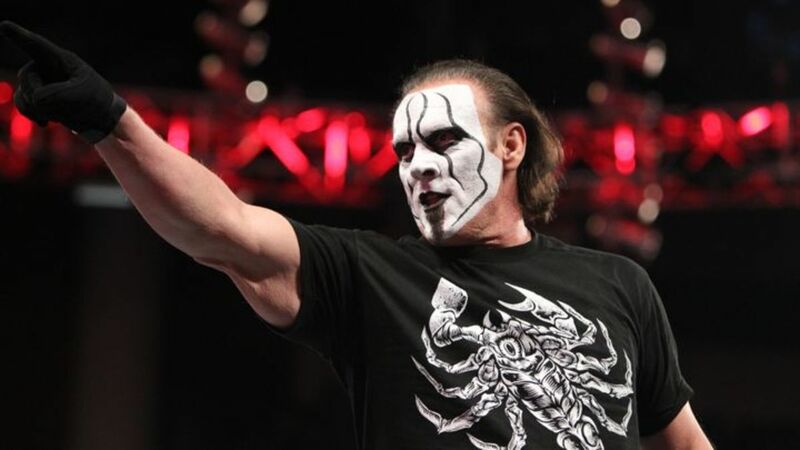 JBL got in the ring and announced Sting as the first member of the 2016 WWE Hall of Fame. Boy, does Sting need the WWE production team to create something for him to get into the Wrestling Observer Hall of Fame. Then again, they might have just done it. They had a piece that featured Kevin Hart talking about how Sting was his favorite wrestler as a child. Cena talked about how he got a blond flattop because he loved Sting in 1989. Robert Flores showed up to put him over. Seth Rollins spoke of having a Sting t-shirt. Ron Simmons talked about how he had the "it" factor. Bret Hart, Booker T and Daniel Bryan were also featured. A great package. If that wasn't enough, they highlighted a tweet from LeBron James, congratulating Sting and saying he was one of his favorites of all time. The Wyatt Family started to do a promo but the Social Outcasts showed up. Heath Slater said grab your penicllin because we're going viral. It ended with Bo Dallas saying they were together like the Four Musketeers. Curtis Axel and Adam Rose looked at him like he was a geek, as if he was supposed to say "Four Horsemen." Ryback ran in to go after the Wyatts. Social Outcasts helped Ryback, so they're comedy babyfaces. Kalisto, after a nontitle victory over Alberto Del Rio on SmackDown, talked about facing Del Rio for the U.S. Championship tonight. Which leads us to our new segment: "Did Josh Norman cut a better wrestling promo than any wrestler on Raw today?" And the answer is yes. Del Rio did a prematch promo where he took credit for Cena's injury, forcing him to miss WrestleMania season. It was such a devastating injury that they never showed how Cena got hurt. Couldn't they do an injury angle of some sort? Instead, nothing. And they wonder why Del Rio got total silence in this promo that should have had a lot of heat. Newsletter readers and writers used to totally massacre WCW for lapses like this. Kalisto got the surprise win after he reversed a German Suplex attempt into a victory roll for the pin. Pretty good match, but JBL's commentary gave telegraphed the result. Del Rio didn't look happy about losing. It was your standard big man-little man match. Kalisto tried several attempts at the Solinda del Sol, but Del Rio blocked both of them. Del Rio went for his Sh! Kick, but Kalisto rolled out of the way and hit a Frankensteiner for a near fall, one of several in the match. Kalisto tried a tope, but Del Rio threw him against the barricades, which looked liked it sucked. They came back from a commercial and Kalisto was already up, where he took another bump after missing a crossbody block. Charlotte and Ric Flair did an interview with JoJo. Charlotte said she beat Becky Lynch "Flair and square." Did I mention that Josh Norman promo? Charlotte said if anything, she was the victim and Lynch the villian. Charlotte was supposed to wrestle Brie Bella, but Lynch ran out and attacked Charlotte. Lynch had to be pulled off of her. Flair then claimed Charlotte was too injured to wrestle and left with her daughter. So basically, Brie flew to New Orleans to do a ring entrance. Good work if you can get it. Lynch did a promo saying Charlotte made a promise when they started in NXT that she would never use her father to climb to the top, but that's what she's done. Lynch said she's going to make Charlotte tap out and win the Divas title. Good promo. For the 1 vs. All match, Stephanie and Vince came out with Owens, Del Rio (why would he be out there after losing his title? ), Sheamus, Kingston, Big E., Woods, Konnor, Viktor, Stardust, Wyatt, Erick Rowan, Braun Strowman, Luke Harper, and Tyler Breeze. Stephanie explained to Reigns that he would fight every one of these men until he collpased. The heels appeared confused over the rules. They started to line up on the apron like it was a tag team match. Then Vince said it would start one-on-one, so Reigns started working against Owens. They went for about 16:00 with Owens controlling using mainly chinlocks. Crowd was totally dead and seemed to be waiting for the Lesnar run-in. Finally when Reigns started the comeback, Konnor and Viktor jumped up on the apron to collect a Superman punch. Breeze ran in to get speared. New Day, Sheamus and Del Rio ran in to attack Reigns. Del Rio gave him a Superkick and Sheamus followed with a Brogue Kick. Finally Lesnar's music played. Cole, the genius, thought Lesnar was going to help the heels. Of course, he destroyed the New Day, Del Rio and Sheamus. The Wyatt Family just watched the whole time and simply went to the back. Lesnar pulled Reigns to the center of the ring, then pulled him up and gave him an F-5. Crowd didn't seem to know how to react. Reigns recovered enough to give Lesnar a smirk as he left, and it's clear that Lesnar and Reigns will be in the Royal Rumble for a showdown of some sort. SUMMARY: Final hour was poorly booked. If the Kalisto title change is going to happen, it needs to happen next week when more people are watching. It also needs to last a few months in order to get him over. Del Rio is already getting a rematch on SmackDown. If they change the title right back, it was get Kalisto under. Either way, it does nothing for Del Rio. The company hasn't clue one how to get him over, which shouldn't be the case if they're paying him seven figures. The 1 vs. All concept was a bad idea because if Reigns was going with the odds stacked against him, why were most of the heels previously in matches on this show? And why were the ones who weren't jobbers? The rules were vague and all but told the audience that Lesnar running in was going to end the show. Which was fine, as long as we didn't have to wait through 16:00 of rest holds. First two hours were good. - The two 'trainers' in the backstage segment were Wild Card J Spade and Luke Hawx, owner and promoter of the local Wildkat Sports. - After the cameras went off, Roman recovered from his beatdown and laid out the New Day.